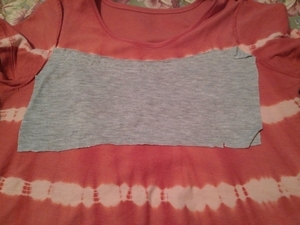 A little over a year ago, I shared my experiment with adding a layer to a t-shirt so that I didn’t have to wear a bra. 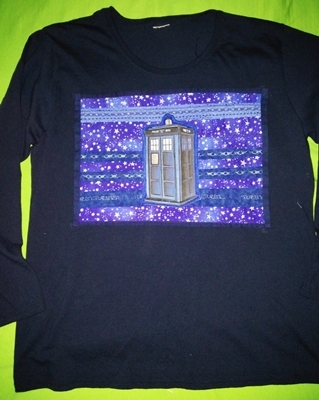 I decided that fusing an image onto the front makes the fabric too stiff. Since then, I’ve been trying a some different ways to do it. 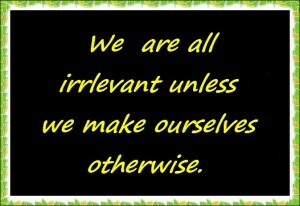 It’s been a lot of trial and error, but I’m not a perfectionist, and I found an easy way that works for me. Someone has asked me about how I do it, so I’m sharing my process here. Although I am pretty much a size 12/14, I buy t-shirts in an X-large or even a 1X. If you’re not going to wear a bra and you don’t want to look like you’re not wearing a bra, then you really need a roomy knit top to work with. 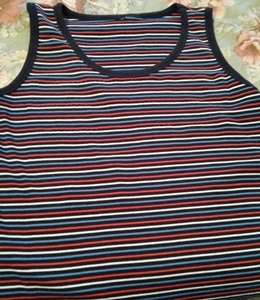 And the knit needs to be substantial — not the sheer or flimsy jersey kind you find at places like Old Navy. You don’t want the fabric to cling to you. I have found that the best and least expensive t-shirts to use are made by Croft and Barrow (Kohls), Cabin Creek (JCP), White Stag and Just My Size (Walmart). Make sure that they are not the “fitted” style but are more boxy. A longer tunic works well too. T-shirts with stripes or graphics also work best because they makes it easier to figure out where to do the top-stitching on the front. You can just follow along one or more stripes or you can incorporate top stitching into the graphic. You can use any kind of knit fabric for the liner. 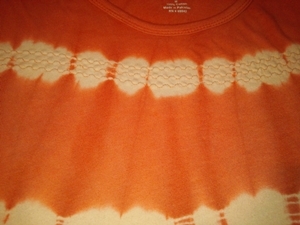 I recycle old t-shirts for that purpose because the fabric doesn’t run. I don’t even bother hemming the edges. You can also buy really cheap t-shirts to cut up at CVS or Walgreens. I buy the largest size they have so that I can make several liners out of one t-shirt. 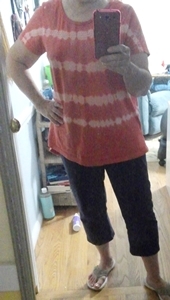 Here, for example, is tie-dyed tunic onto which I sewed a lining so that I could wear it without a bra. I measured a rectangle shape that would be large enough to cover my breasts and cut out a double layer from an old grey t-shirt. 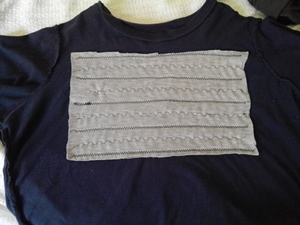 I pinned and then hand-basted the rectangular double layer onto the inside of the front of the shirt, positioning it so that I could top-stitch along the front design. 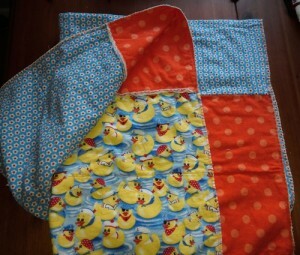 I used a decorative stitch, but a zig-zag would do just as well. This is what the top stitching looks like. You can make the liner go all the way down to your waist if you want to. Since it’s not attached at the sides, if it’s longer, you can tuck it into your pants or skirt, leaving the shirt itself loose. You can also use several layers of the knit for the liner if you feel more comfortable with more coverage. It’s best not to use a ribbed knit t-shirt because top stitching is harder to do; the ribbing stretches out and pulls the shirt out of shape. 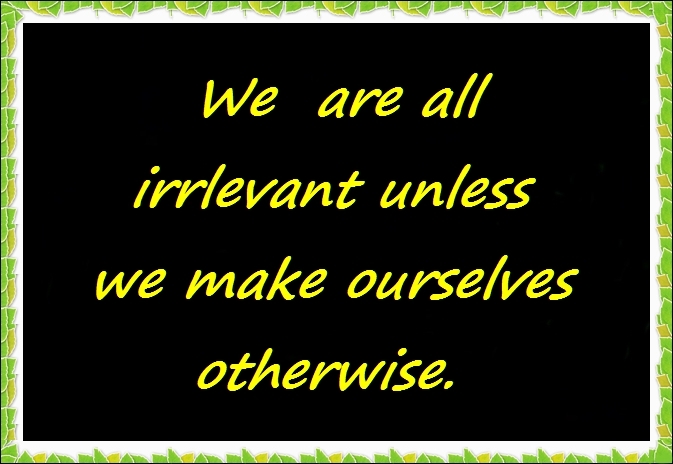 It can be done, however. 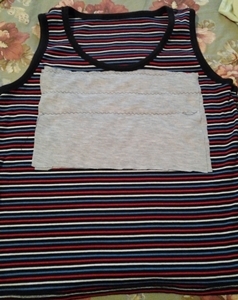 Here’s a ribbed tank top that I lined. 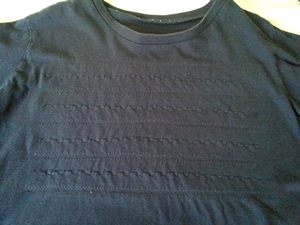 Here’s what the front of a solid navy t-shirt looks like with decorative top-stitching that looks a little like trapunto quilting. As I said, I’m not a perfectionist, so I don’t worry how the liner looks on the inside. 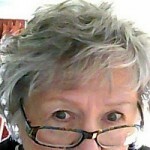 Someone who is more meticulous, however, can adapt my method to work for them. If anyone reads this and tries it, I would love to see what you did and how you were able to improve on my idea.